Is the Pro Plan Right for You? We’re really proud of Yesware and want to be sure that it’s available to anyone who wants it. That’s why we’ll always have a free version with 100 tracking events per month – it lets us show everyone the value of Yesware. If you’re a sales or marketing professional, 100 tracking events likely isn’t enough for you to make it through a full month of prospecting and closing deals. If you’re a solo sales master, our Pro plan can help you achieve your goals with unlimited tracking events and the ability to set reminders and schedule messages. Tracking is at the core of Yesware and gives you immediate feedback on the effectiveness of your message. When you use tracking, you’ll be notified in real time when your prospect opens your message and interacts with it by clicking links and finding out more about your product. The Pro plan will make sure that you have an unlimited supply of these notifications so you’re always gaining insight about the people you communicate with. Nothing is worse than knowing that you need to do something, but not know what. Yesware’s reminders are here to help! 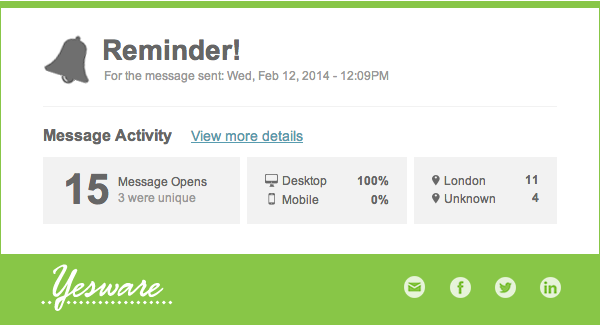 When you set a reminder for an email, we’ll make it easy for you to follow up. Just configure your reminder before sending a message and we’ll bring that message right back to the top of your inbox for you when you need it. The reminder will also contain all of the tracking data from your original message so you can follow up with confidence. 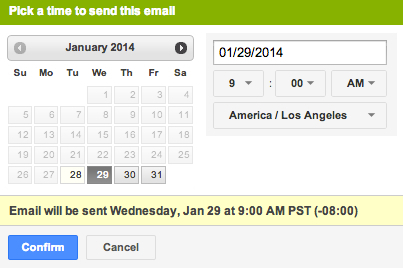 Take control of when people receive your messages by scheduling them for a time they are more likely to be opened. Working with people from different time zones? You compose the message – let us take care of the rest. Think the Pro plan is the right plan for you? Head over to our plan overview page to get started. Need more information before making a decision? Shoot our sales team a quick note or call us at 855-YESWARE.